I have the pressing with the B side runout variant "B 716653-01 B3 MK 3+V XLLP 324". Side A sounded mostly excellent, with just a little surface noise. Pretty sure side B is off center—my stylus was moving back and forth and it was playing with increasing wow and flutter as the side progressed. The disc also has a slight dish warp, so it could have been that. Anyone else experience this issue? 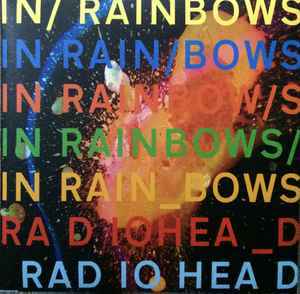 You really can't go wrong with In Rainbows on vinyl. One of the easiest and best vinyl purchases you can make. Cheap, too. Just be sure to get a European press but that is a general advice for Radiohead vinyl. wonderful pressing, super quiet and very dynamic all the way through. Lovely pressing! Sounds kind of unintentionally distorted in places, and there's a loud pop in Faust Arp, but besides that, a great pressing! I don’t see this version anywhere on Discogs. There’s no indication of where this was pressed but if I’m not mistaken, that format looks like GZ. Massively disappointing considering the cost. Anyone else have this version? Wonderful, quiet pressing. Possibly one of the best sounding that i have. What others have written is accurate. This is a great sounding pressing. Low noise, great dynamics. I've listened to this albums dozens and dozens of times, but I heard things in this pressing that I'd never noticed before. How can you tell difference between 2007 and 2016 lp? Can't even begin to explain how much better this pressing is compared to TBD. It sounds so much better, and it's way cleaner.